TKTS sell discounted theatre tickets from 25% to 50% off ticketed prices. 1, 2, 3, 4, 5, 6, N, R, A ,C are all subway lines that stop at 42nd Street / Times Square. Walk up Broadway to 46th Street. Make a left on 46th Street (West) towards 8th Avenue. TKTS is located between 8th Avenue & Broadway. 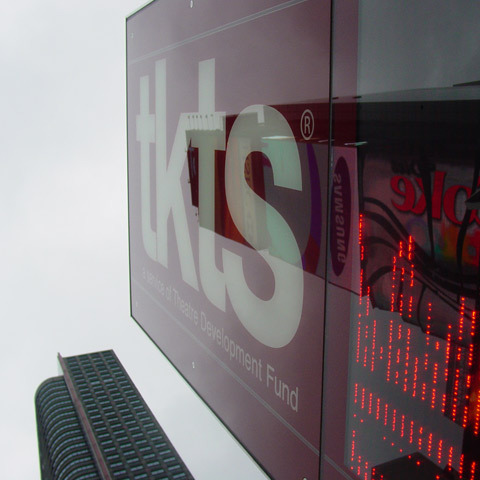 TKTS is operated by the Theatre Development Fund. This is one of the best resources for reduced tickets to Broadway and Off Broadway shows. Receive discounts from 25% to 50% off ticketed prices. TKTS has two locations and each location has different resources so be sure to choose the right one. - Times Square location sells day-of-performance tickets only. - South Street Seaport sells tickets to evening performances on the day of the performance, and matinee tickets the day before. TKTS Times Square accepts only cash, travelers checks or TKTS Gift Certificates. TKTS Seaport accepts credit cards, cash, travelers checks or TKTS Gift Certificates. Both locations sell tickets at 50%, 35%, and 25% off full-price (plus a $4.00 per ticket service charge, which helps support other TDF services and programs). Availability and ticket inventory change throughout the day and at the discretion of individual productions. Theaters release tickets for sale by TKTS throughout the day, with more tickets often available within a few hours of showtime.